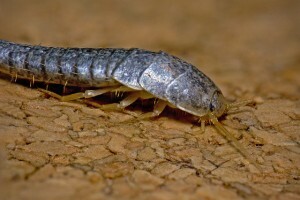 The silverfish is a small insect usually less than 25mm in length. Both its names are strikingly descriptive; its Latin name, Lepisma saccharina, refers to the creature’s diet of carbohydrates such as starch and sugar, while its common name of silverfish refers both to its colour and fluid movements. The silverfish is an extremely fast runner and often manages to escape predators such as spiders. Silverfish like damp conditions, which explains why they’re commonly found in bathrooms and garden sheds. They’re nocturnal and live in tiny cracks and crevices. Silverfish eggs usually take between 2 weeks and 2 months to hatch into nymphs. These resemble the adults but are smaller and white in colour. As they grow older they become darker with a silvery sheen, and they shed their skins up to 30 times a year. They live for between 2 and 8 years. The silverfish evolved somewhere between 350 million and 400 million years ago. To give you an idea of how old this species truly is, the earliest dinosaur we know about lived 243 million years ago. Silverfish had existed for more than 100 million years before the first dinosaur even hatched!